The Bass Station should be placed directly below the Vibratron, approximately three to six inches out from the front wall, with the dispersion baffle facing your listening position while obstructing the view of its resonator satellite. 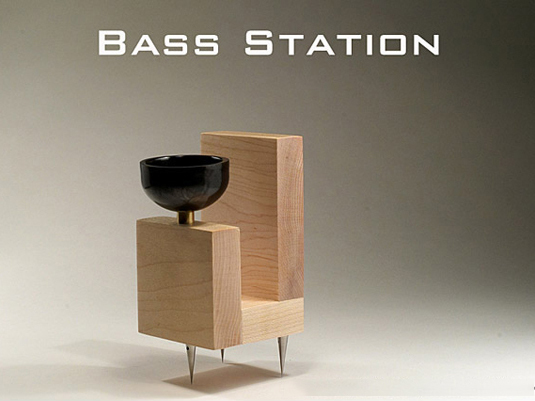 The Bass Station may also be placed on the floor behind a rack or piece of furniture, just below the Vibratron. This will not hinder the Bass Station’s performance. If necessary, the Bass Station can be positioned in front of the equipment rack or furniture, directly below the Vibratron, and in between your main speakers for a significant improvement in low frequency performance. Razor sharp patent pending Stilettos are included with the Bass Station to couple the characteristics of its bass resonator to your room. Simply screw the Stilettos into the Bass Station for noticeably tighter low frequencies and precise image placement. If you have carpeted floors, be certain you press down hard on the Bass Station so its razor sharp Stilettos make solid contact with the floor.